Regardless of the trade prohibition, pangolins are rapidly disappearing from China and across their ranges in East and Southeast Asia, and they have become the most frequently seized mammal in Asia's illegal wildlife trade, as smugglers sell the increasingly profitable creatures to meet culinary and medicinal demand (Pangolin, notably foetuses, are considered a culinary delicacy in China, and are often eaten in order to ‘impress’ guests and demonstrate social class). More than 30,000 pangolins were seized between 2000 and 2007 across East and Southeast Asia, most of them bound for China via Thailand or Vietnam (CITES Prop. 11.13, 2000; TRAFFIC SEA, 2004; Idris, 2005). It is believed that most of these originated from Malaysia and Indonesia, as populations in most other range countries have already been so drastically reduced (TRAFFIC SEA, 2004; TRAFFIC EA, 2006). An estimated 25,000-50,000 wild pangolins lived in China in 2000, according to a national survey, and populations in Guangdong and Hunan provinces have since dropped as low as 10 percent of the 2000 estimate, with populations in other provinces likely to be extinct, according to Li Zhang, the technical director of Conservation International's China program leading the study. A pangolin trade report compiled in 2011 by NGO Education for Nature-Vietnam (ENV) documented 159 pangolin trade cases over six years, with most seizures in the northern provinces of Vietnam (en route to China), consisting of animals sourced outside the country. 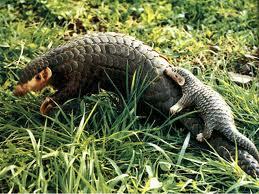 ENV noted that when live pangolins are confiscated, there is no rescue centre or zoo that can accommodate the animals. Authorities usually auction off confiscated pangolin shipments, where they often end up re-entering the illegal market. Moreover, although pangolins are listed as CITES Appendix II and are therefore “subject to particularly strict regulation in order not to endanger further their survival and must only be authorized in exceptional circumstances”, permits for commercial trade can be granted by local authorities. Pangolins have been a staple of traditional Chinese medicine for thousands of years, and while subsistence hunting of pangolins has likely been prevalent for millennia, current large-scale commercial harvesting appeared only a matter of decades ago. China’s rapidly growing human population and increased wealth have significantly increased demand for pangolin ‘products’, resulting in criminal commercial-scale harvesting which is not sustainable, as pangolins are being harvested at rates far above that at which they are capable of replenishing their populations. Indeed, pangolins are extremely vulnerable to over-exploitation as they are easily hunted, have a very slow reproduction rate and do not easily breed in captivity (Lim, N. and P. K. L. Ng. 2007. Home range, activity cycle and natal den usage of a female Sunda pangolin Manis javanica (Mammalia:Pholidota) in Singapore. Endangered Species Research. Vol. 3: Preprint, Published online June 20, 2007). According to the 2008 Report on Proceedings of the Workshop on Trade and Conservation of Pangolins Native to South and Southeast Asia for TRAFFIC, “The greatest threat to the conservation of pangolins is illegal hunting for trade, largely to supply demand in China for meat and scales, used for tonics and traditional medicines”. Despite national legislation banning hunting throughout the pangolin’s Southeast Asia range, this growing illegal trade is forcing the endangered animals closer to extinction. As Chris Shepherd of TRAFFIC stated, "The ongoing massive-scale trade in these species does highlight a failure of the Convention." Pangolin researchers gathering in Singapore in November 2011 concluded that increased demand from China has led to "great declines" in pangolin populations across Cambodia, Vietnam, and Laos, that pangolins from Indonesia and Malaysia now supply the bulk of East Asian markets, and that traders are importing pangolins into China from as far away as Africa, where four of the eight known species live. China is a member of CITES, but the country permits some pangolin consumption for medicinal traditions; scales may be used in clinical treatment and in the manufacturing of patented Chinese medicines. Both uses are permitted only in designated hospitals, not through retail sales, although this ‘loophole’ is widely abused. As Chris Shepherd of TRAFFIC noted, even in countries with strict penalties, violators are rarely punished to the full extent of the law. "Penalties need to serve as a deterrent and until this happens, the trade will continue," he said. Most governments have implemented bans on hunting or trading the animals, and violators face harsh penalties with potential imprisonment. However, as range countries acknowledge, enforcement is generally weak due to a lack of wildlife management personnel and funding. To help countries fight the constant increase in the illegal trade, TRAFFIC recommended that pangolins should be uplisted to CITES Appendix I. The Journal of Chinese Medicine strongly supports this recommendation. As with most endangered animals, pangolins face an additional threat from habitat fragmentation and degradation due to human activities. However, pangolins play an extremely important ecological role as predators of eusocial insects, consuming large quantities of termites and ants, thereby keeping insect numbers in check (Corlett RT (2007) The impact of hunting on the mammalian fauna of tropical Asian forests. Biotropica 39:292–303). The absence of pangolins to ‘regulate’ such insect numbers could affect the ability of human beings to manage the negative impacts of such insects (e.g. termites destroying wooden buildings, crops, cloth, etc), with the potential – or, in some places, actual - loss of the pangolin proving both tragic from a biodiversity perspective and ruinous economically.